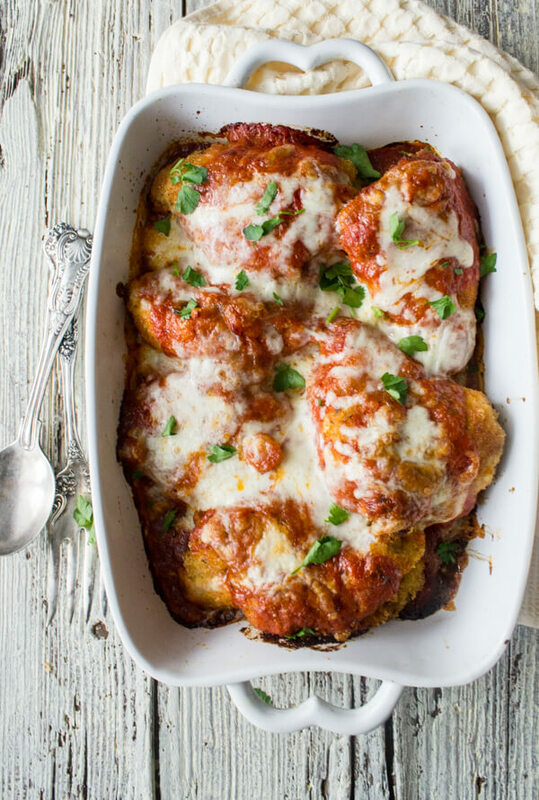 Baked Chicken Parmigiano so good and cheesy the perfect Company is Coming or Family Dinner Recipe. This Chicken Parmesan will become your family’s favourite recipe. has to be one of my favourite dishes, seriously. Do you ever make one of your favourite dishes and it is so freaking good that you always say to yourself, “why don’t I make this more often”? 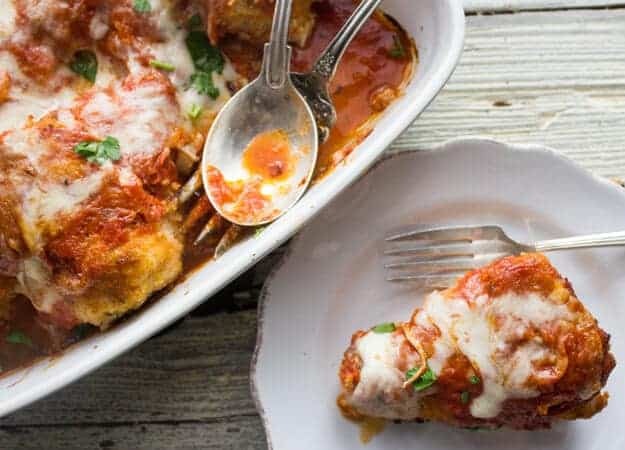 Well this is my why-don’t-I-make-it-more-often recipes.I can remember whenever I went out with my friends in Canada for dinner, Baked Chicken Parmigiano was usually what I ordered. although, yeah this would have been amazing served with Pasta. Maybe next time. For this recipe I like to buy a boneless piece of chicken and cut it myself. I prefer thicker pieces of chicken for this dish. More Chicken Recipes you may Enjoy! I also learned from my Mom that the best coating for pretty well anything are crushed crackers, instead of bread crumbs. Although bread crumbs work well also. Remember though if you use salted crackers, cut back on the extra salt. 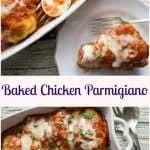 Baked Chicken Parmigiano is a great dish to serve when you have guests for dinner or when you are craving a tasty comfort food dish, easy and quick to put together. I love baked dishes because I always think it looks like you did so much more and it’s healthier too, which is always a bonus. Besides who can resist a delicious chicken dish with an amazing sauce and melted cheese? I know I can’t. Buon Appetito! 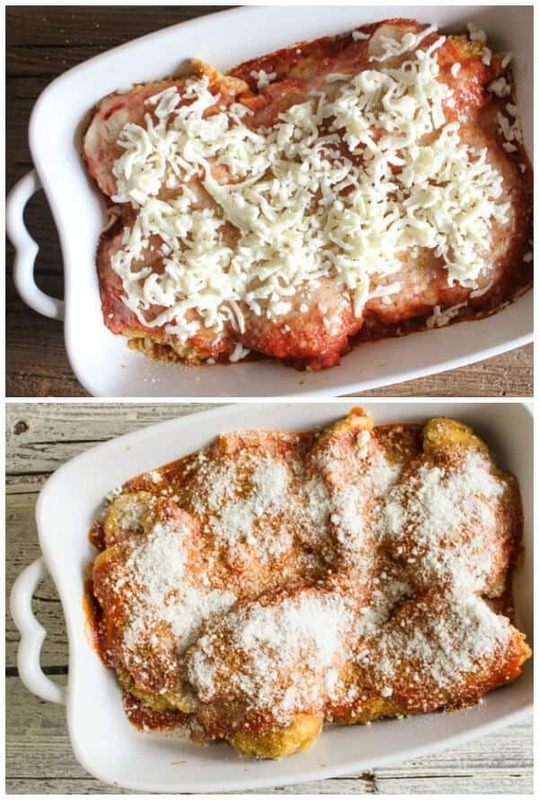 Baked Chicken Parmigiano, an easy, delicious baked chicken casserole recipe. A perfect comfort food dinner for family or guests. The best! Pre-heat oven to 350° (180° celsius). Lightly grease a medium to large baking dish. In a medium bowl beat eggs. On a medium plate add cracker crumbs. Dip chicken pieces first in egg and then roll and cover well in cracker crumbs. In a medium frying pan add 3 tablespoons (45 grams) olive oil and brown chicken. (approximately 3 minutes on each side). 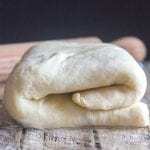 Place in baking pan in a single layer. In a medium pot add olive oil, garlic, puree, water, salt, oregano and basil, stir to combine, bring to a boil then lower heat to low-medium and continue to cook until thickened, stirring occasionally (approximately 10-15 minutes). Stir in butter. 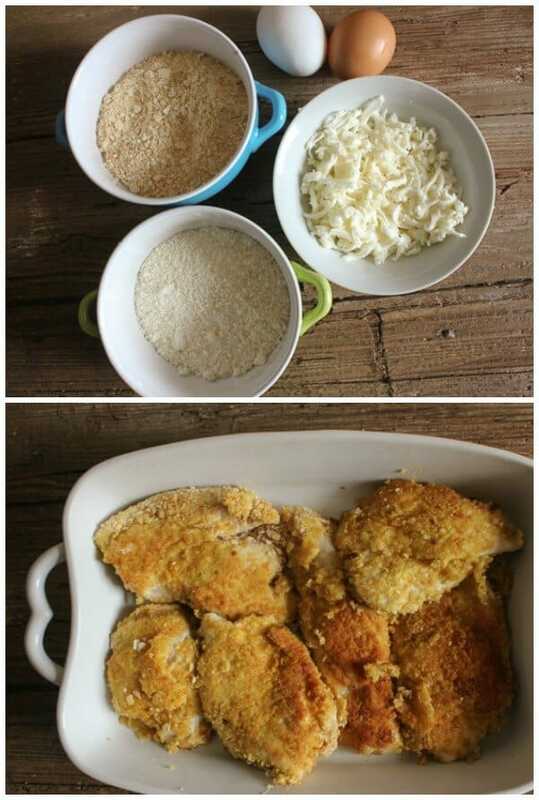 Pour sauce over chicken, sprinkle with Parmesan cheese. 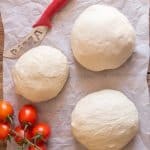 Cover with foil and bake for 30 minutes, remove cover, top with grated mozzarella cheese and continue to bake for approximately 10 minutes. Serve immediately. Enjoy! Re published from March 2015. Hi Carolyne, thanks so much, so glad you enjoyed it. Have a great weekend. This chicken is my favorite recipe. My family loves it! Thank you!! Hi Lana, so glad you enjoyed it. Have a great week. Just beautiful chicken was so tender. Could you prepare this the day before. Just made this, excellent, used my own homemade tomatoe sauce however. Will definitely make again. Hi Janet, so glad you enjoyed it. Have a great week. Hi Heather, I hope you like it, it’s quite easy. Let me know. Thanks Michelle, I hope you all enjoy it! Hi Veronica, thanks, I love using crackers instead of bread crumbs. Have a great day. Just looking at your pictures makes my mouth water!! 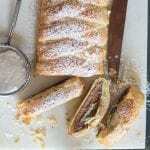 Will have to make this VERY SOON! I have never used crushed saltines instead of breadcrumbs. Very interesting. Can’t wait to try this! I subscribed again, but it told me I was already subscribed to Mail Chimp. Don’t know how—but that’s my story! Hi Diane, thanks, hope you like it. So glad you are still following, have a great day. Hi April, thanks, yes she did have some good ideas. 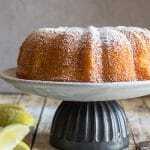 Hi Judit and Corina, thanks I know I love this dish too. Thanks for stopping by. Hi Marisa, thanks one of my favourite dishes, actually what don’t I like? lol. Yes you do have to subscribe again because you are subscribed through wordpress. Maybe because you blog too. Who knows. Thanks have a great day.